The Wyoming landscape in Grand Teton National Park is stunningly beautiful. This range often represents the entire Rocky Mountain range in countless photographs, postcards, and imaginations. This section of the Rockies is a wondrous playground for climbers, hikers, skiers, and nearly all other outdoor enthusiasts. The Highway 89 Overlooks and Turnouts in Grand Teton National Park are a "must do" on your Grand Teton vacation. The vantage points are so perfectly placed that you can truly grasp the proper perspective on just how tall these mountains are. You see, often times with mountains, the closer you get to them, the less "high" they appear because of the angle you're looking at them with. On these overlooks on Highway 89 in Grand Teton National Park, you're at the perfect height and the optimum distance to get the most amazing views of the Teton Mountain Range you could ever imagine. Each of these Highway 89 Overlooks and Turnouts in Grand Teton National Park are right off the highway except Schwabacher Landing. 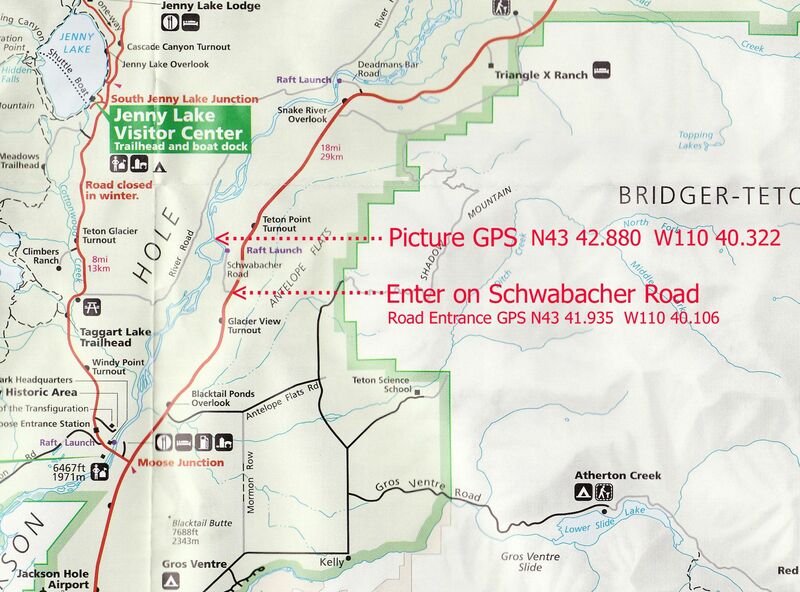 To get to Schwabacher Landing, you must take US-191 N/​US-26 E/​US-89 (about 16 miles north of Jackson, Wy.) turn onto a gravel road called Schwabacher Rd. Drive to the end off Schwabacher Rd. (appx. 1 mile) and park in the raft launch parking area. Hike appx .4 miles along the Snake River until you come to a wooden bench. There are multiple vantage points in this area but directly in front of the wooden bench is the ideal location. For Google Maps driving directions to Schwabacher's Landing click the green "View Map" icon and then select "Get Directions" in the upper left hand corner of Google Maps. 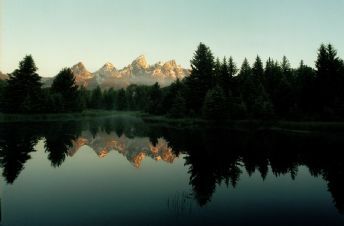 Photo Advice: Sunrise and early am hours are the best time to photograph most locations in the Grand Tetons. The same is true for the Schwabacher's Landing and Moulton's barn. Arrive early to this popular location to assure yourself the best setup location. In my opinion the best time of year to photograph the Moulton Barn is April as the mountains are still covered in snow but the foreground grass is just starting to sprout. However, I feel July is the best time of year to photograph Grand Teton National Park as a whole. The reason I recommend visiting the Tetons in July is the snow melt from the mountains raises the water levels in and around the Snake River creating popular reflection pools. If you visit in July this will allow you to still photograph the Moulton Barn as well as other popular locations such as the refection pools at Schwabacher's Landing. Photo: Hasselblad 503CW 40mm lens Kodak 160VC f22 @ 1 second July 2008.